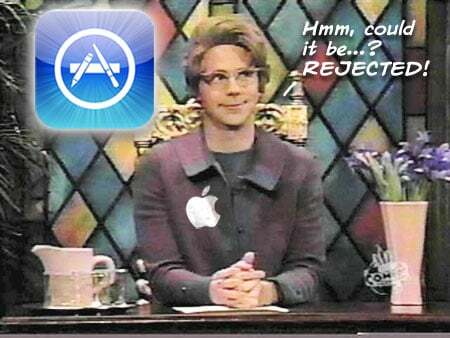 As part of their response to the FCC's investigation into the rejection of Google Voice, Apple stated that they 1) receive about 8500 apps and app updates to review each week, 2) each app is reviewed by two reviewers, and 3) employ more than 40 full-time, trained reviewers. With 17,000 [8500 x 2] reviews per week and 45 reviewers, that means each reviewer performs 378 reviews per week. At 40 hours per week, this is 9.4 reviews per hour, or one review every 6.4 minutes. Ash points out how this means months of work by a developer is left to the tender mercies of less than 10 minutes (counting overtime) with someone tasked to look at almost 400 other apps that same week. Can we get a "yikes!" There could be 41 full-timers and 40 more part-timers. There’s a lot of evidence to indicate that most (if not all) of the front-line reviews are by non-native-English speakers and on schedules that strongly imply that they’re offshore. This may be the cause of a lot of the frustrating rejections in which the reviewer didn’t understand something about the application or description that seems clear to most Americans. To recapitulate. Between iPhone users and 8500 weekly app submissions (each reviewed twice), stands possibly an unknown number of outsourced, untrained frontliners, 40 odd trained, full-time second liners, an unquantified star-chamber of executive reviews, and ultimately one Phil Schiller who may or may not email the developer or a blog (or two) about it?